We write a lot of articles here about how RV travelers can get Internet service. All the options are some type of wireless service (Wi-Fi, Cellular, Satellite) because there is no wire that stretches with your RV down the road! But wired is almost always better than wireless, it’s more reliable, it’s usually faster, *and* there are generally no usage limits. So if you have that option – do it! What do I mean by a ‘wired’ connection? I mean DSL or Cable. A service where you have a physical wire (or cable) to your Internet Service provider. If you’re staying in one RV park for 3 months or more, you may have one of these options. We are currently staying at Paradise Island RV park in Fort Lauderdale, Florida. We got here mid-October and we’ll be staying thru March. There are telephone lines at each site in this park so we called AT&T to get DSL Internet service. They turned on the service at our site within just a few days, and we are paying $42/mo which is supposed to adjust down to $19/mo promotional deal after the first month. This is the second winter season we’ve done this. When we left last April, we just called AT&T and told them to discontinue service. Not so long ago, you had to sign a yearly contract to get service, but that’s not the case now. The AT&T line gets plugged into a DSL modem and that in turn is plugged into our WiFiRanger router. So, I don’t need to change anything about how my computer connects – it connects to the WiFiRanger via Wi-Fi. If your park does not have phone lines to the site, you might still be in luck if they have Cable. Check with the park office, or with the cable company to see if a Cable Internet connection to your site is possible. If you’re parked in one spot for the season, check it out. 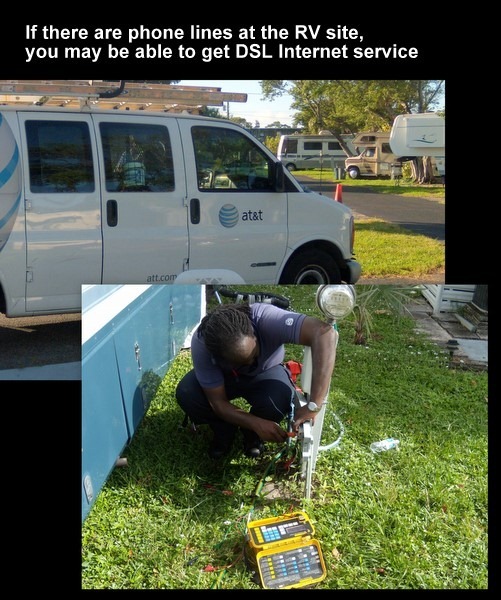 See if DSL or Cable is an option for you. You’ll need to ask several questions – just because there is cable, or phone lines at the site, it doesn’t necessarily follow that you can get the Internet service. But, if you can, I highly recommend it. I love the unlimited high speed Internet connection we get with DSL. We can use all of our tech toys (5 laptops, one iPad, one ‘Dash’ and leave them online all the time with no worries of going over limits. We can watch streaming movies from Netflix, and TV shows on Hulu. Life is good! The only problem is I am SOO spoiled for our summer travels! Published by MrsGeek, in Blog. Tagged with DSL for RVers.